Bellisio Foods, Incorporated is engaged in the production of diverse frozen foods catering to American consumers. The company is headquartered in Minnesota, USA. Originally, Bellisio Foods was founded as Michelina’s by founder Jeno Paulucci. Paulucci and his parents were immigrants from Italy who brought their love for food and cooking with them, along with their Italian heritage. Paulucci started his business in the year 1990. Paulucci got the inspiration for his company from his mother Michelina, who believed in the beauty of food. Michelina Paulucci always shared her hearty and delicious dishes for everyone to enjoy. This is what inspired Jeno Paulucci to make great food. The company’s current name Bellisio is inspired by the founder’s hometown in Italy, Bellisio Solfare. Bellisio is also an Italian word for beautiful. The name was chosen because it fit the family’s belief that food is beautiful. As part of the company’s commitment to sustainability, most of the company’s products are packed in an eco-friendly packaging that uses less petroleum and plastic. The company also makes sure to save water in all of its pasta making processes. In addition, the company built digesters to covert food scraps to useful biofuel. Currently, the company produces two million meals everyday, on average, at its main production plant. Everyday, the company uses about 6,000 gallons of cream, 1,000 bushels of wheat, and 40,000 lbs. of cheese. This is just part of what makes up more than 500 tons of ingredients that are used to create products everyday. These raw materials are what go into more than 400 products of the company. Among the products that it offers, are entrees (multi-serve or single packs), side dishes, specialty sauces and snacks. Bellisio Foods has also become the third biggest producer in the U.S. when it comes to frozen entrées. Although the USA is the company’s primary outlet, it also distributes its products to twelve other countries, including Australia, China, Canada and Russia. Bellisio Foods also owns the Fusion Culinary Center, which conducts research and development for a number of restaurant chains in the country. From Duluth in Minnesota, the company’s products are now manufactured in the city of Jackson, Ohio. The facility in Duluth has not been closed however, as research and development is still being conducted at the plant. I want to comment on Git-r-done grub biscuits & sausage gravy. It has a very good taste, however the second biscuit gets so hard you cannot eat it. I have tried twice, it happened both times. I heated it according to directions. I agree with Michelina that food is beautiful, but it should also be good for you. Love your stuff, but couldn’t you make is just as good with less fat and carbs? I’d buy a lot more if I thought it wouldn’t eventually kill me. The comment at the end was very funny. Tried these when Food Lion here in Virginia had them on sale. Very tasty, good portion size and economical as we’ll. 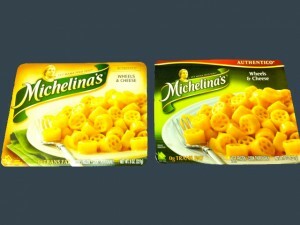 Michelina’s is a good product! Michelina's Fettuccine Alfredo with Chicken and Broccoli is the finest I've eaten in any restaurant. Michelina would be proud of her legacy.